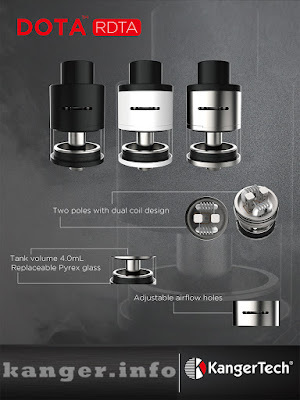 The Kanger DOTA RDTA (Rebuildable Drip Tank Atomizer) is the first RDTA designed by Kanger, it is a 25mm rebuildable tank which features the best of both dripping and tanks. The DOTA features a velocity style deck, which allows you to build a wider variety of coil configurations! Kanger’s DOTA also has a 4mL liquid capacity and side-fill for convenience. You will experience and taste the incredible dripper like flavor along with the convenience of a tank.